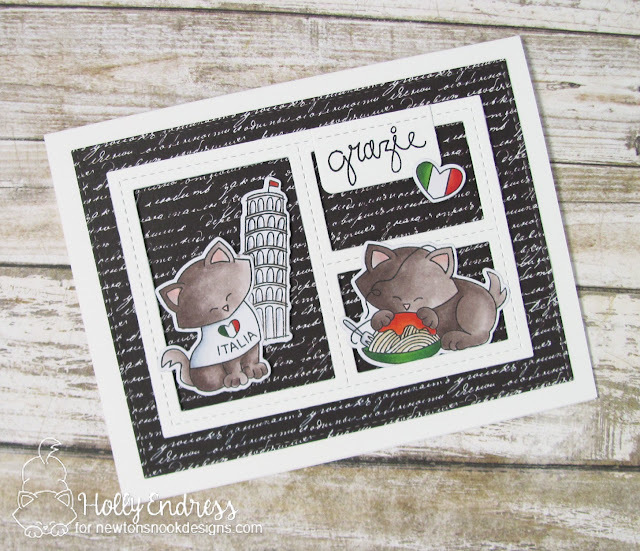 Hi everyone.. it's Day 2 of the Newton's Nook Release Preview and today we are sharing the Adorable new Newton Dreams of Italy set and it's coordinating dies. I started out by created an A2 size White card base and then I added a piece of pattern paper from my stash that I die cut with Stitched Rectangle die. Then I die cut a Frame from a piece of White card stock and adhered that with some foam tape. I stamped all the images onto some Copic friendly paper and colored them in with Copics and used the coordinating dies to cut them out. I adhered the images with some additional foam tape and added some Clear Wink of Stella to the Flag on the shirt and the heart. I stamped the sentiment onto an additional little banner from the same die set and adhered it over the upper window. This is my favorite set in this release!! Amazing card!! 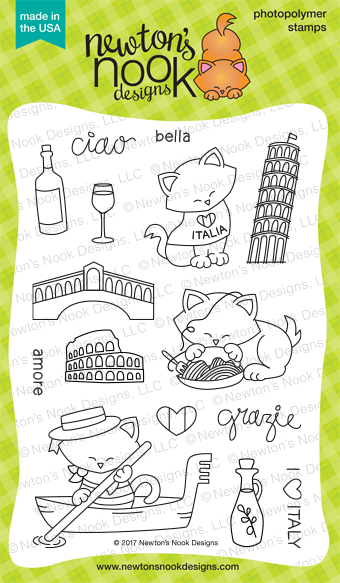 Love, love seeing the super-cute Newton with spaghetti al sugo and Pisa Tower!! :D I'm italian :) and I'm so proud to see my places and my language with my favourite cat on this stamp set! :D I Just ADORE it! This set is adorable! I love that you can make such a cool scene! Very cute card, love how you were able to use more stamps by having the windows! Your card is just so adorable. Love your layout. Such a fantastic card!! I love your layout and the images/sentiments you used!!! This new set is so adorable! Newton Dreams of Italy is absolutely adorable! Really fun new release! Very cute card...love the black and white with the Italian colours. I love this Italian Newton, really very cute! And the card you've made is adorable! Simply adorable card. And the kitty eating spaghetti. How wonderful. Love your card, cats and Italy. Love the cute card and how you used a lot of images from the stamp set! It turned out really awesome!!! The background paper is great. I'm sure Newton's favorite word is 'manja'!! Love this! Cute design with the frame. What a cute little scene you created. The patterned paper is a nice touch. Love you card! Envious of your coloring skills! Like the blocking on this card. Love the background. And how you used the frame. Love this cute Newton image wit Italian loge, great design! So very fun, I have been to Pisa, need this for sure! Gorgeous card -- love your color choices and your coloring is awesome!! Love the design. This stamp set is sooo cute! Wow! I'm happy to see some of my favouite places of my country in a stamp set!! !I live near to Pisa, in Florence. Grazie for this adorable card!!! Great card, isn't this the cutest stamp set! I love the way you paired all those images together! They really pop off that fun black background paper! Such an adorable card! Goodness, this is just wonderful! Love the design and how you incorporated so many of these darling images! You captured it well .. eating pasta and seeing the leaning tower are two things I think will be at the top of my list when I finally get to Italy! I have to have this awesome set, thanks for such amazing inspiration!